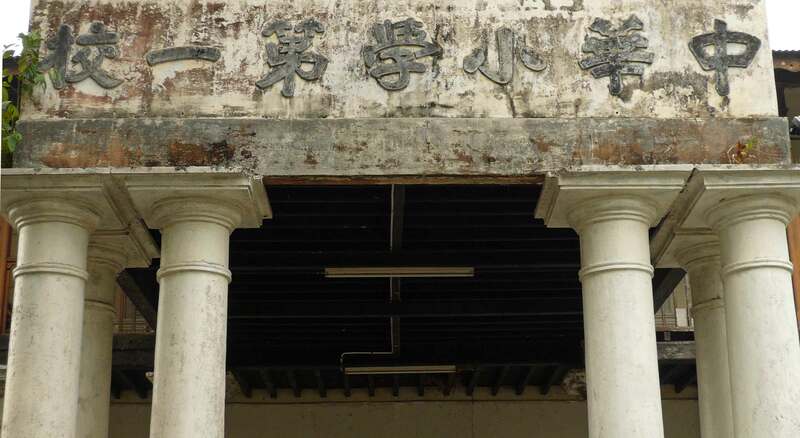 The imposing, colonial mansion style old Hokkien school is located on Jalan Tabuan. Its backside borders Kuching’s Reservoir Park. It is garnered by old Saga trees (Adenanthera pavonina, which produces the ‘buah saga’, bright red lentil-shaped fruits). 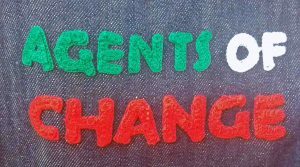 Adjacent are the present Chung Hua Primary School No. 1 ‘SJK(C)’ buildings. 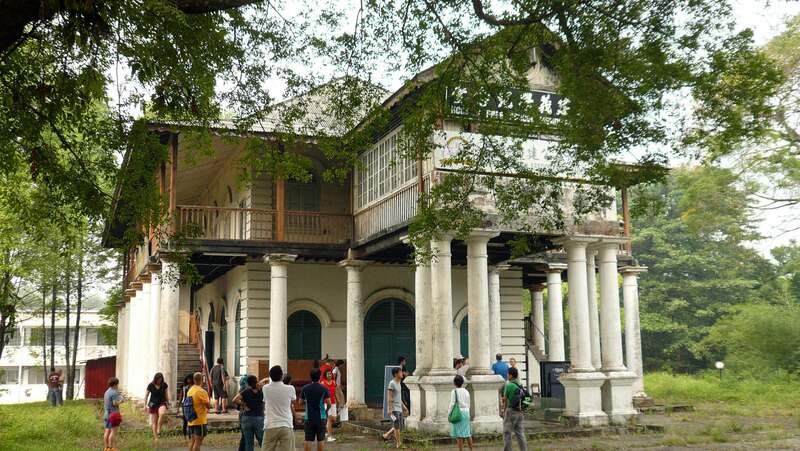 The site visit that took place on 22 August 2015, organised by PAMSC (Malaysian Institute of Architects Sarawak Chapter) and the Sarawak Heritage Society attracted a sizeable group of heritage fans. Mr. Wong Kok Nyen (ex-history teacher and treasurer of the Kuching Hokkien Association), Mike Boon (conservation architect and past president of SHS) and Karen Shepherd (SHS President) provided rich information on the history of the building as well as its architecture and state of conservation, highlighting its heritage value. 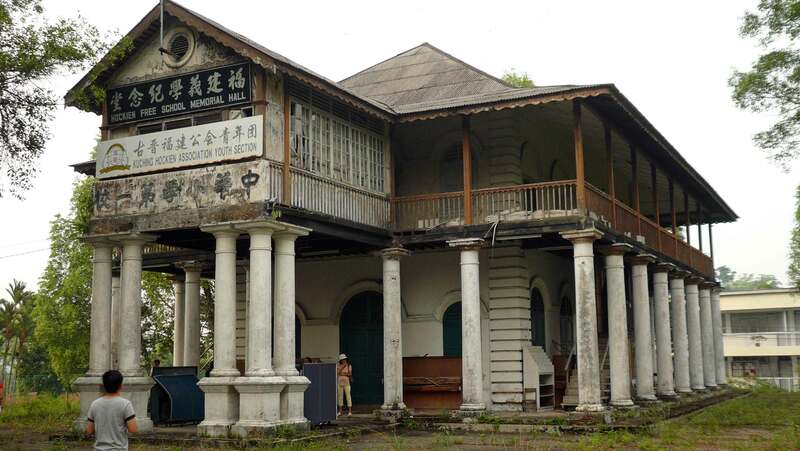 The history of the building is embedded in the history of Sarawak’s community of Chinese descent and of Sarawak’s education system. The construction of the school dates from 1911 through an initiative of prominent Hokkien community leaders. 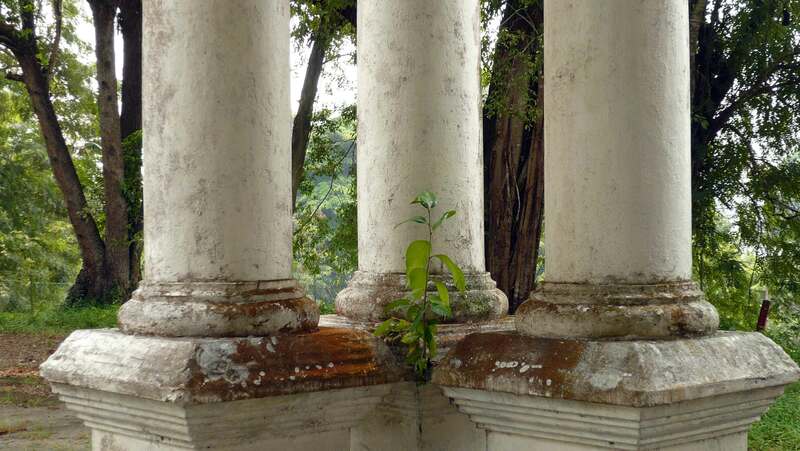 The architecture reflects the colonial-influenced tastes of the day. 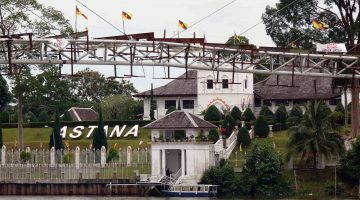 The imposing mansion-like design (without much adaptation to the needs of a school…) undoubtedly aimed at impressing with the achievements of Sarawak’s Hokkien community. The seemingly “cut and paste” pattern, inspired by other existing buildings may be explained by the limited pool of architectural and construction skills that were available locally in the early 1900’s. The building can also be related to China’s history: 1912 was the year of the Chinese revolution, a time of deep change of perspectives for the overseas Chinese communities which were still strongly relying on the motherland for higher education. Over the years, the school expanded. The building is currently unused and in a status of disrepair. The members of the architects’ association present at the visit rated the building’s structure as being still healthy in spite of the lack of maintenance and of some unsympathetic renovations such as patching cement over the lime mortar and use of modern paints, which seem to have affected the breathing properties of the original materials and to exacerbate degradation caused by moisture retention. This majestic and elegant building is one of Kuching’s rare remaining early 1900’s colonial buildings still in rather good condition, and arguably one of the important landmarks that contribute to Kuching’s special “sense of place”. It clearly deserves to be protected and conserved. 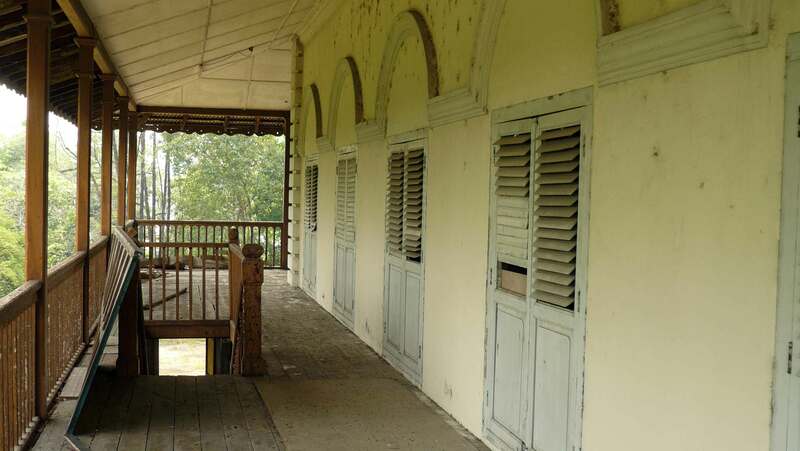 From a heritage point of view, the location of the building, adjoining Kuching’s Reservoir Park, is an asset. Enclosed HERE is a working paper (pdf, 5 pages) that we prepared further to the site visit to present more specifics on the building. Additional information or comments on the building and its history, which may help to refine this paper, are most welcome. Kindly use for that purpose the “Reply” box below. Next post Kuching Heritage Race - Saturday 30 January am - Register! According to an article in the Sarawak Gazette (vol. 122 no. 1531 March 1995 pp. 46-53) a woman named Lena Ricketts recalled that the Chinese school in Pig Lane was the site of a brothel for Japanese officers during the second world war (p. 48). So if the stretch of Tabuan where this school is located was called Pig Lane during WWII, then presumably this is the school Ricketts was talking about. The article is attributed to one V. L. Porritt, but unfortunately Porritt gives no information about how or when he gleaned the information from Lena Ricketts.